This sweet little gal arrived in the mail yesterday. 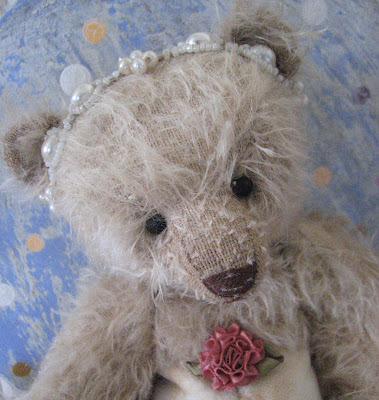 She is a Wee Scone Bear made by Diane Kennedy. 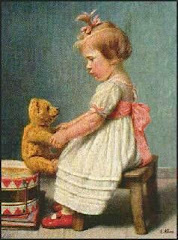 Diane is an amazingly talented Teddy Bear Artist. 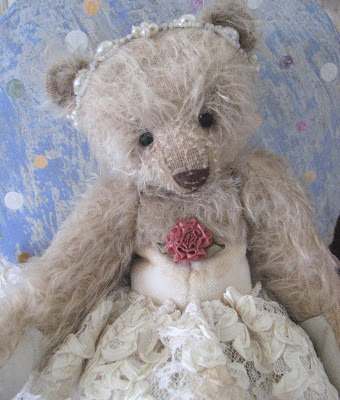 This Ballerina Bear was made in 2007 and I missed winning her then. To my surprise, she was up for sale on eBay last week by her first owner. I guess it was a dangerous afternoon of browsing, LOL. I found her with only one hour left to go on the auction. I think she has such a pretty face. 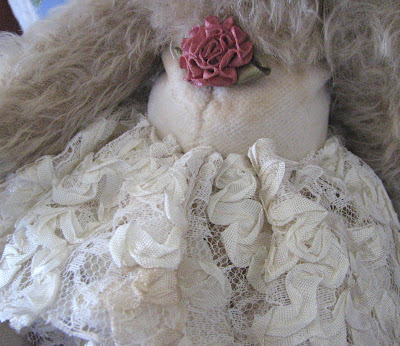 The lace tutu and cream velvet is adorable. I am thrilled she is mine! OOOOh Karen, she is beautiful! I do love Diane's bears, being the proud owner of three of them, myself LOL! She really is gorgeous! Your new ballerina bear is sweet and how neat that you got a second chance to have her. What an adorable teddy bear....luv the details.I bought one recently at a church sale and Grace made her her own...didn't have the heart to take the bear away from her.I guess puppy dogs luv bears too! She is beautiful. I can't get over the details. I also love your previous post. always love lace with flowere. too bad I am not a size small either.Take care.